Another great season of posts on your part. Thanks for all the analysis and entertainment. One thing that I particularly appreciated in your posts this season was the continued optimism during our four game skid back in September. I'm a consistent reader on RF.com but that place got way too gloomy for an optimist like me during our struggles. 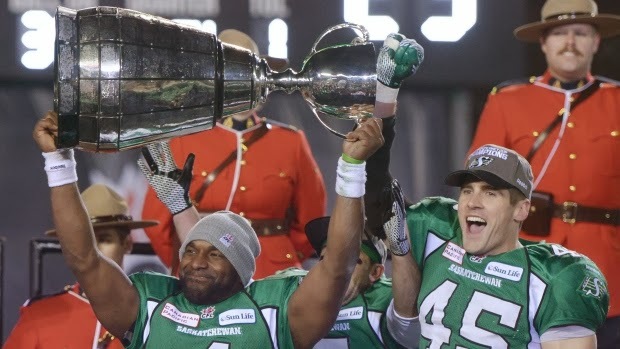 You've always delivered a nice balance in your posts and that's why I'm always telling other Rider fans that you're one of the best and a must read twice a week. It sure does feel good to be the champs! Dan - Appreciate the kind words man, it means a lot. This year was easier than normal to stay balanced. Unlike past years, you could see talent at every position and a high quality coaching staff. Each side showed their power at different times and you could just tell that if they ever got going all at once great things would happen. Let's see you top this one, Santa!